To celebrate its 20 anniversary, Western Air Lines gathered several aircraft at Lockheed Air Terminal. Serving as a backdrop to the cake-cutting was a Douglas M-2 biplane, a Douglas C-54 Skymaster and a Douglas C-74. Three planes told the story of transport aviation yesterday at Lockheed Air Terminal where Western Air Lines celebrated its 20th birthday — the beginning of its third decade — as the oldest air carrier in the nation. Representing the past was Western’s historic M-2 biplane, with criss-crossed wires, fabric fuselage and external control cables, a 100-m.p.h. two-place “speedster” that in 1926 inaugurated W.A.L.’s original mail service from Los Angeles to Salt Lake City. For the present was the airline’s 54-passenger Spymaster, a sleek, 36-ton luxury liner recently placed in operation on Western’s newest route linking Los Angeles and Denver. And in the future was the giant Douglas C-74, a bug-eyed monster weighing some 80 tons and destined to carry nearly 100 passengers nonstop over transcontinental ranges. The two decades of commercial flight were spanned not only by the planes, but by the men who began herding the rickety little M-2’s over the mountains to Salt Lake City without radio or weather reports. The photo above appeared in the April 18, 1946, Los Angeles Times. 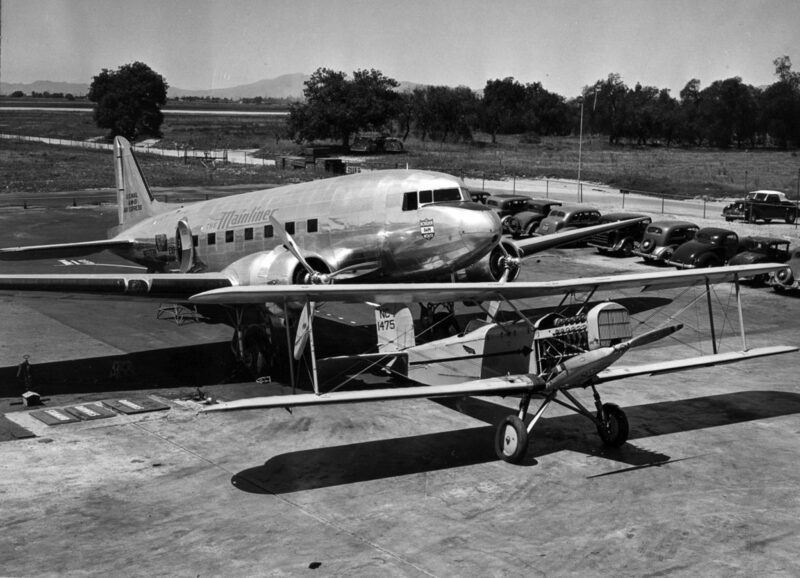 The Lockheed Air Terminal is now Hollywood Burbank Airport (formerly Bob Hope Airport). In 1941, Western Air Express changed its name to Western Air Lines. Later the name was shortened to Western Airlines. In 1987, Western Airlines merged with Delta Air Lines. This post was originally published on Jan. 24, 2017.